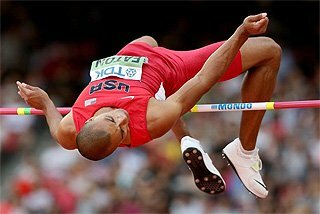 London, UKWorld records*, Olympic records and surprise winners – the final full session at the London 2012 Olympics had a bit of everything. Even another gold for host nation Great Britain. The curtain came down on the action inside the Olympic Stadium in spectacular fashion in the men's 4x100m Relay, and in the only way that Jamaica knew how – with a World record. That the times were fast was no surprise, given the results of yesterday's semi finals where both USA and Jamaica dipped under 37.40. But today they were both faster; much faster. Jamaica were led off by Nesta Carter, who handed over to Michael Frater, while USA had Trell Kimmons and Justin Gatlin on the first two legs. 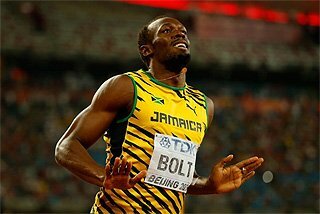 Another sound changeover saw Yohan Blake tear around the top bend past Tyson Gay, but the final changeover to Usain Bolt was not as good as Gay's pass to Ryan Bailey and both teams began the final leg level. Even then, the end result was inevitable as Bolt scorched down the home straight to bring Jamaica home in 36.84, smashing their previous mark by 0.20. USA equalled the old World record of 37.04, but were at least rewarded with another national record. After Canada initially crossed the line in third, they were later disqualified as Jared Connaughton ran on the line. 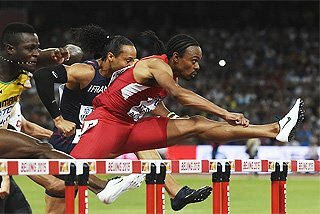 It promoted Trinidad & Tobago (38.12) to the bronze medal position, 0.04 ahead of France. 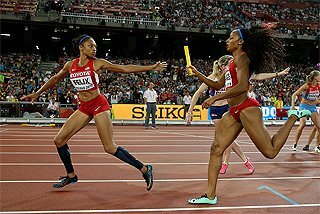 Half an hour earlier, USA had taken gold in the women's 4x400m Relay, running the fastest time in the world for 19 years. Led off by DeeDee Trotter (50.5), Olympic 200m champion Allyson Felix produced an astonishing 47.8 split to give her team an unassailable lead. Francena McCorory coasted around her lap in 49.39 before Sanya Richards-Ross brought them home with a 49.10 leg, stopping the clock in 3:16.87 – the fastest time in the world since 1993. Repeating the same podium finish from the past two Olympics, Russia took silver and Jamaica bronze. After a 51.0 opener from Yuliya Gushchina, the other members of the Russian team – Antonina Krivoshapka (49.6), Tatyana Firova (49.88) and Natalya Antyukh (49.67) – all dipped under 50 seconds to finish in 3:20.23. Jamaica, anchored by Novlene Williams-Mills in 49.46, clocked 3:20.95. Meanwhile, Ukraine (3:23.57) held off Great Britain (3:24.76) to finish fourth. The 5000m was always going to be a big ask for Mo Farah. Having to recover from the high of winning 10,000m last weekend and competing in his third – and by far most competitive – race of the Games, a medal of any colour was by no means a guarantee. It was still anyone's to play for too as the field approached the final lap. 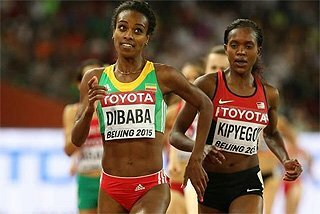 The opening pace had been pedestrian as the lead hesitantly exchanged between several athletes, passing through 3000m in 8:42.95. But the pace wound up over the final kilometre as the real racing began with 400m to go. 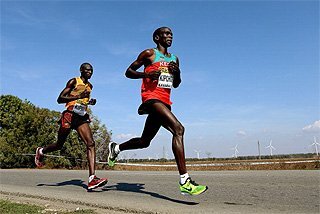 A 52.94-second lap saw Farah hold off strong challenges from world leader Dejen Gebremeskel and Kenya's Thomas Longosiwa, winning with a time of 13:41.66 – a third of a second ahead of his Ethiopian rival, having covered the last kilometre in 2:25.19. 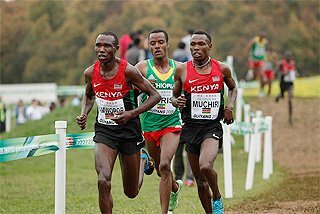 USA's Bernard Lagat was fourth, one place ahead of Kenya's Isiah Koech. In one fell swoop, teenager Yelena Lashmanova dispelled two myths about race walking – the first that it is a boring event; and the second that there's never a close finish. 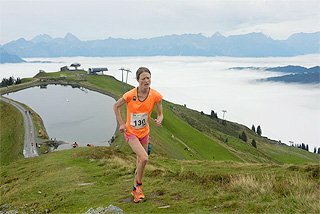 Defending champion Olga Kaniskina was out to win her fifth successive global title, and went off like a rocket, covering the first half in 42:33 – under World record pace. Lashmanova, meanwhile, was biding her time in the chase pack, waiting patiently to make her move. That came after 12km, with her break being marked by China's Qieyang Shenjie. The pair closed in hard on Kaniskina and with one kilometre to go, Lashmanova was just a few seconds behind her older and more experienced compatriot. A visibly panicked Kaniskina tried her best to hold off Lashmanova in the closing stages, but the 19-year-old breezed past with 100m to go and crossed the line with in 1:25:02. 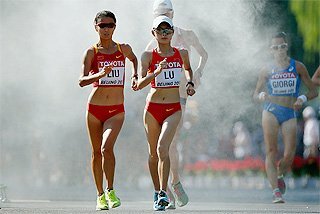 Kaniskina finished seven seconds behind, while Qieyang set an Asian record of 1:25:16 in third. Earlier in the day, The Mall near Buckingham Palace also played host to the men's 50km race walk. After disappointment in the 20km event, Russian athletes were out for redemption – and they gained exactly that, taking the title and placing all three athletes in the top six. 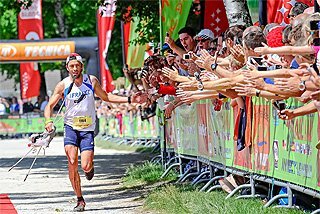 Two-time World champion Sergey Kirdyapkin had looked to be out of contention at one point as he was seven seconds behind the leaders at 30km. But he came back in dramatic fashion and quickly opened up a big lead. With just 5km to go, he was 26 seconds ahead of his chasers, but he continued to pull away. He crossed the line in 3:35:59 – the fastest 50km race walk ever witnessed at a major championships, smashing the Olympic record. Australia's Jared Tallent timed his race to perfection to successfully defend his silver medal with a PB of 3:36:53, while China's Si Tianfeng – one of the early leaders – also set a lifetime best of 3:37:16 for the bronze. 'Super Saturday' last weekend may have been a great day for host nation Britain, but today Russia went one better with their very own 'Super Saturday', taking four gold medals in total. Having won both the race walking events earlier in the day, the gold rush continued through to the evening. First up was the High Jump, which had been expected to be another big clash between World champion Anna Chicherova and World Indoor champion Chaunte Lowe. But that head-to-head did not quite materialise as the American wound up in sixth place after failing to clear 2.00m. 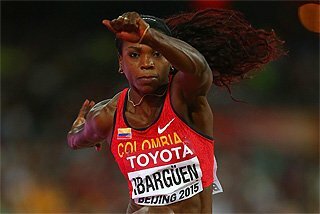 Instead it was her team-mate Brigetta Barrett who posed the biggest threat to the Russian, and she cleared a lifetime best of 2.03m to move into second. But Chicherova sailed over 2.05m on her second attempt as Barrett and bronze medallist Svetlana Shkolina (2.03m) could not match her, wrapping up the title. Given the quality of athletes in the women's 800m final, it looked as though it had the potential to be an extremely competitive race. But ultimately World champion Mariya Savinova ran away with the title as defending champion Pamela Jelimo faded in the home straight and Caster Semenya timed her charge too late. USA's Alysia Montano had led through half way in 56.31 before Jelimo took up the running on the back straight, at which point Semenya was at the back of the field. Savinova began to move up before kicking clear of Jelimo and storming down the home straight to win by more than a second in a world-leading 1:56.19. Semenya overtook the fading Jelimo to take silver in 1:57.23, while Russian champion Yekaterina Poistogova also caught the Kenyan on the line to take bronze in 1:57.53 – the only athlete in the field to set a PB. The men's Javelin final had always looked as though it would be an open one, but few could have predicted that the winner would be a 19-year-old from Trinidad & Tobago. Less than one month ago, Keshorn Walcott became the first athlete from his country to win a global title in a throwing event, taking gold at the World Junior Championships. Four weeks on from that victory, he now has another global title – an Olympic one, no less! He opened with a PB of 83.51m before improving to 84.58m – the second-best mark ever by a junior athlete. It may be the lowest winning mark at the Olympics since 1988, but that mattered little to Walcott. 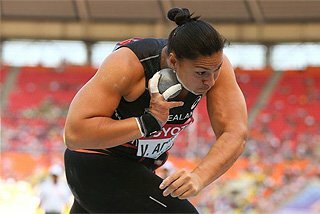 All that mattered was that it was enough to take gold, and by the margin of just seven centimetres. Ukraine's Oleksandr Pyatnytsya threw 84.51m in the third round to take the silver medal, while Finland's Antti Ruuskanen moved into third on his fifth-round throw, 84.12m. Most surprising were the athletes who missed out on medals in fourth to sixth. After setting a world-leading 88.34m in qualifying, European champion Vitezslav Vesely was exactly five metres down on that to finish fourth. 2007 World champion Tero Pitkamaki was fifth (82.80m) as two-time Olympic champion Andreas Thorkildsen surrendered his title, finishing sixth with 82.63m. 11 AUG 2012 General News Jamaica crush 4x100m Relay World record - 36.84 in London!